When it comes to decor, there are few alliances as simple and natural as that of white and wood. The white brings luminosity and freshness as well as a sense of modernity while the wood warms and softens it. The two tones are very complementary yet self-sufficient. They are also the perfect foundation for other forms of decor and design. You can introduce different colours or materials once you have white and wood. In this article, we have put together 10 examples of this duo from the most modern to the most rural. You will also see how it can work in just about every room. When one thinks of a bathroom decorated in white and wood, one often imagines a Scandinavian look and feel or a rustic design. In this bathroom, we can see how we can achieve both! The white and wood forms the backdrop of the bathroom while the ceramic tiles bring patterns and colours to the environment. They attract the attention of the whole room! 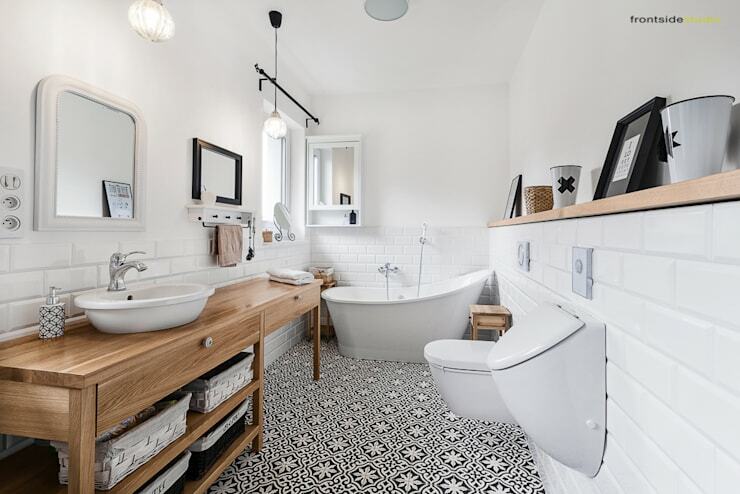 The result is a simple, sober and warm bathroom that is packed with energy. 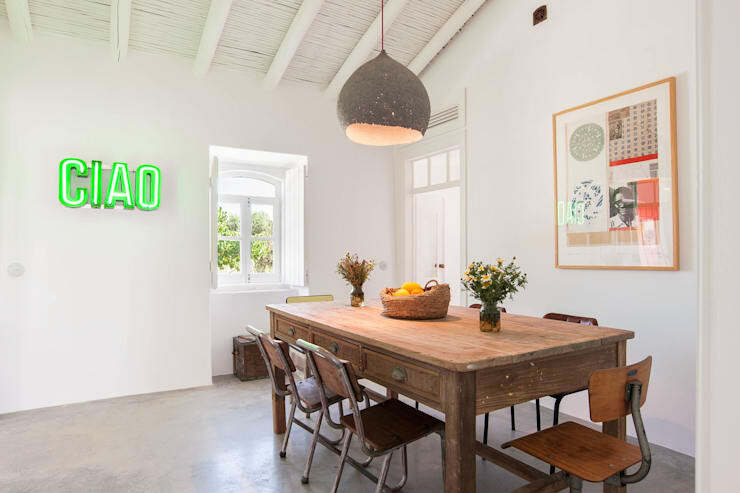 In this home, we can see how the wooden furniture introduces rustic charm while the white walls bring in light and modernity. This translates flawlessly in the dining room, creating a very impressive space. The environment is further enhanced by the decorative picture frames and little vases of flowers. This design also shows how important natural light is for a white and wood combo. This corner office is appealing in more ways than one! It features a combination of white furniture and wooden finishes, creating a balance between modernity and warmth. 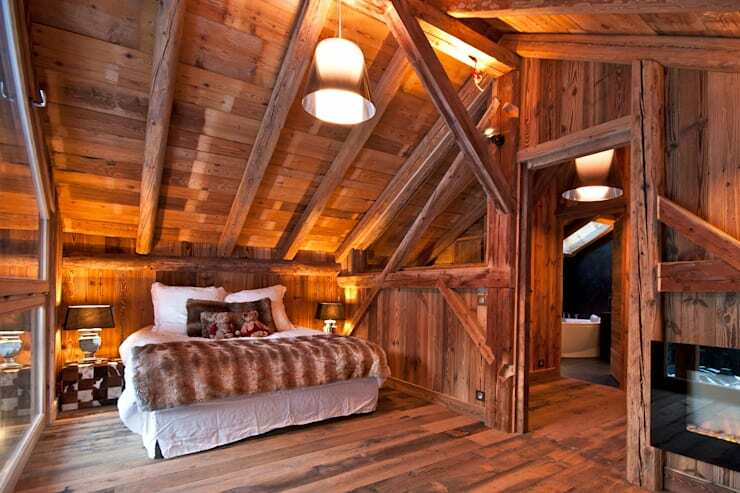 The use of wood breaks up the white tones, softening the design of the room. Simply charming! 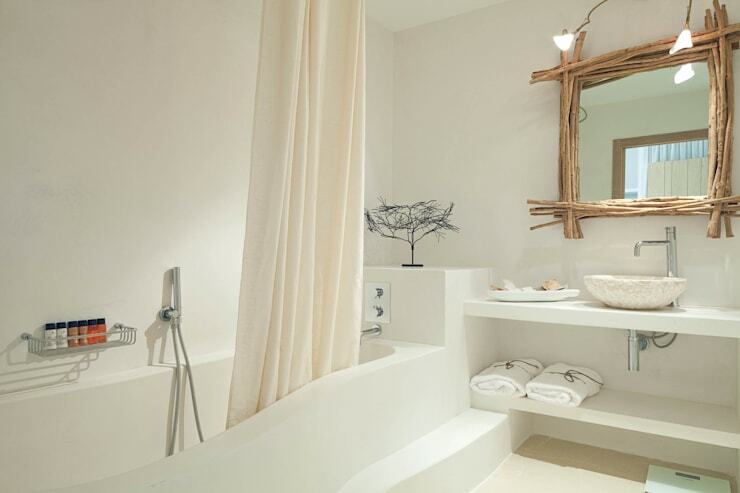 Here is another example of a wooden and white combination in the bathroom. The driftwood mirror makes for a stunning first impression while giving the bathroom a slightly Mediterranean look and feel. The result is a very soothing space. 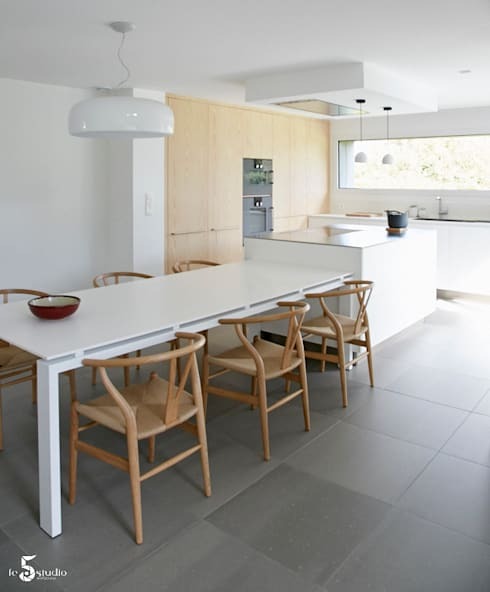 Modern kitchens in all-white can sometimes lack friendliness and cheer, but this is not the case here. The wood creates a charming balance, while the curved lines contrast with the clean straight lines. This kitchen is simply sublime! 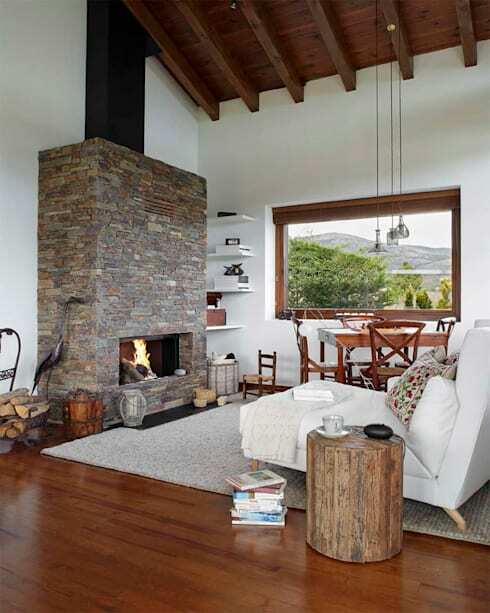 This living space features a combination of wood and white, resulting in a very comfortable, warm and relaxing interior. 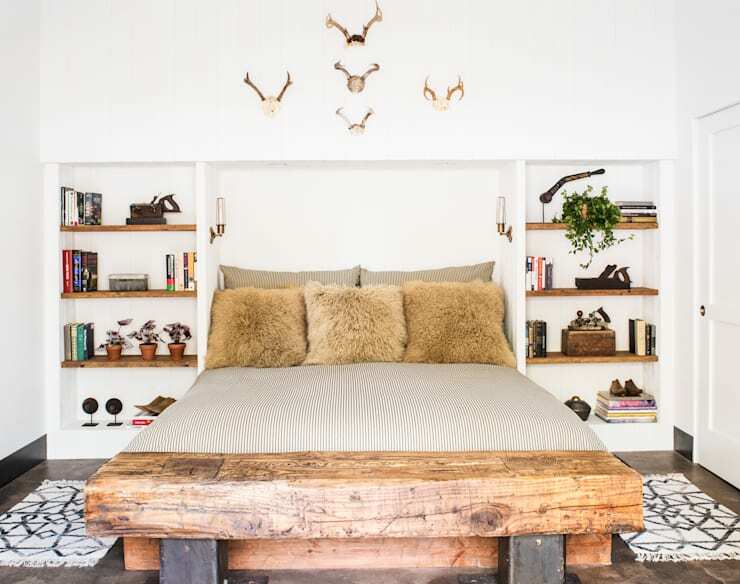 This homes takes on a more country-style look and feel thanks to the darker wood. It makes this space feel like a little cocoon. Don't you love the stone chimney, which adds a new texture to the environment? Wood and white seem so natural in any room, but why not add some colour to highlight certain objects or pieces of furniture? Here we can see how the bright red sofa becomes the center of attention, yet it is complemented by the neutral tones around it. In chalets, wooden homes or homes with wooden frames, white is an ally of choice. It will illuminate the room. The less dark a wooden space is, the more charming it will be. Choose white linens and fabrics, like we see here, which creates a simple yet peaceful look and feel. In a very luminous room, the wood will become even softer. Thus you want a room to receive as much natural light as possible. Opt for tones that will reflect the sunshine and make sure your windows stay wide open! Have a look at these tips for bathing your home in natural light. 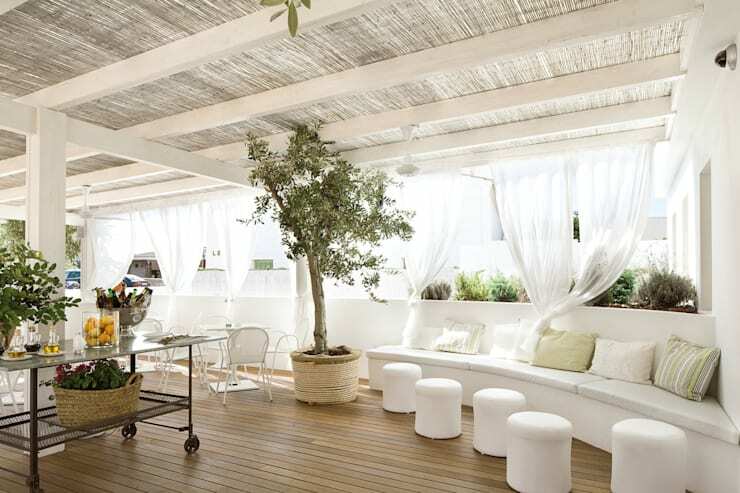 Wood and white are perfect, especially on the terrace. Here we can see how a pergola enhances this colour combination, making for a very refreshing design. This is especially ideal on warm days! 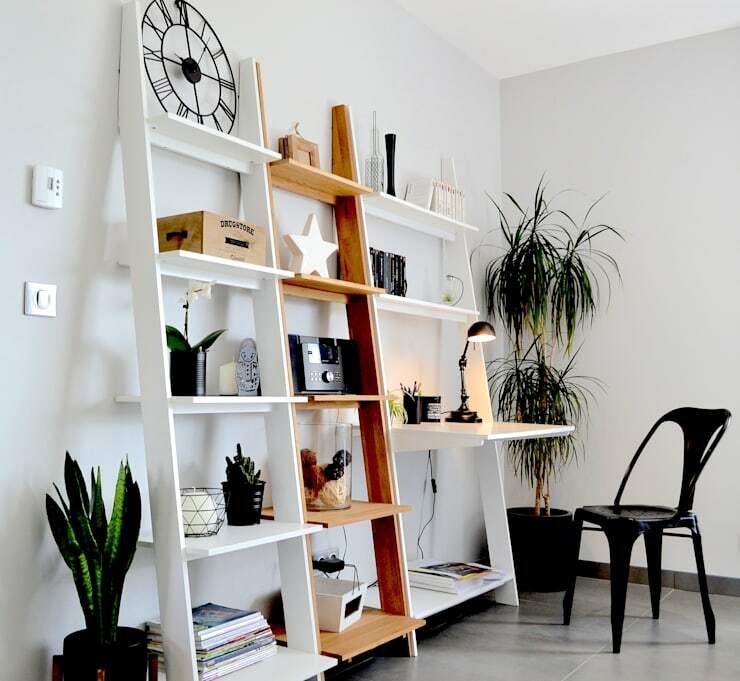 If you've enjoyed this house, you'll love this white wooden house that's charming and warm. Are you impressed with this combination?